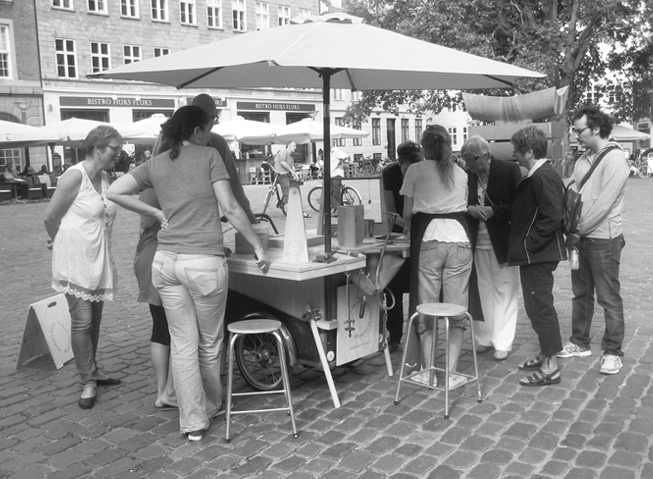 We launched Makers Move on the streets of Copenhagen during the “Skt Loye Jewellers” events in 2012. From the imprints made by the mobile workshop – a cast of each participant piece with a story was made and put in a “Toollerybox” to exhibit in five different contemporary jewellery galleries . We asked each participant to pick up their pendant to bridge a connection between the street and the galleries. Anne lived for many years in a house with a garden full of hollyhocks. She treasured this garden very much. Now she lives in an apartment on the 4th floor in the Amager, neighbourhood of Copenhagen, and misses her garden full of flowers. Anne was lucky to get an allotment where she can grow hollyhocks, and therefore always carries seeds that she finds. At her new place there is a small shed on the allotment, where her hollyhocks can grow again. “Toollerybox” with pendants. We asked each participant to pick up their pendant to bridge a connection between the street and the galleries. Imprint of Nadia's key chain with a fragment of a map of Palestine 1948. Nadia’s grandparents fled Palestine in 1948 and settled in Jordan. The key chain Nadia always carries with her is a map of what once was Palestine. Philip is a bicycle mechanic apprentice and likes to go out in the weekend and have a lot of drinks together with his friends. On these occasions, his friends know that at some point they have to make sure to take Philip’s silver chain, and mobile phone from him to prevent him from losing them during the course of the evening. Phillip is pleased with his friends’ thoughtfulness, since the chain means a lot to him, as it was a gift from his sister when he turned 18 years old.